“The Sixth Section” opens a surprising window on immigration in the twenty-first century. 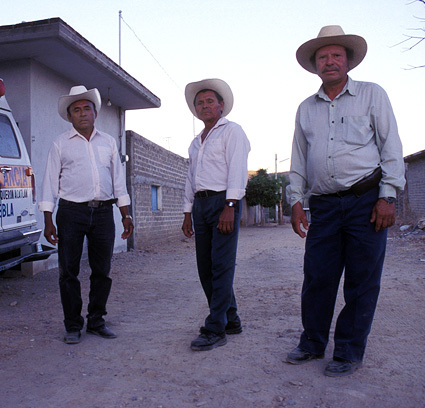 Following a group of Mexican immigrants from the tiny desert town of Boqueron who now work in upstate New York, the film documents their struggle to support themselves – and their hometown 2000 miles to the south. To do this, the men form a ‘union’ that raises money in the form of weekly donations of or from each of its members in New York. In the past few years the group has brought electricity, an ambulance and, most dramatically, a 2,000-seat baseball stadium to Boqueron. “The Sixth Section” is an intimate portrait of how ‘The American Dream’ is being redefined by today’s immigrants. A P.O.V. Co-Presentation. Alex Rivera is a media artist and filmmaker who, for the past 10 years, has worked with digital video and on the Internet to tell unique stories of the Latino experience. He recently completed a series of short films for P.O.V.’s Borders web series, and produced for Hector Galan on the PBS series Visiones. He won the Sundance/NHK International Filmmaker award, and a Silver Hugo. His works have been screened at The Museum of Modern Art (MoMA), The Guggenheim Museum, Lincoln Center as well as on PBS and at numerous film festivals around the world. He lives in New York City. Bernardo Ruiz is a writer and filmmaker whose credits include the shorts, “Night Magic” and “The Devil’s Twilight” (with Eli Wallach). He recently produced a 10-week interactive web documentary, Leaving Elsa, for P.O.V.’s Borders web series. Ruiz’s writing has appeared in the Los Angeles Times and The Miami Herald. He is a recipient of a film grant from the New York Foundation on the Arts and an Emerging Maker grant from Latino Public Broadcasting. He lives in New York City. P.O.V. / American Documentary, Inc. This program was produced by Second Generation Media which is solely responsible for its content.